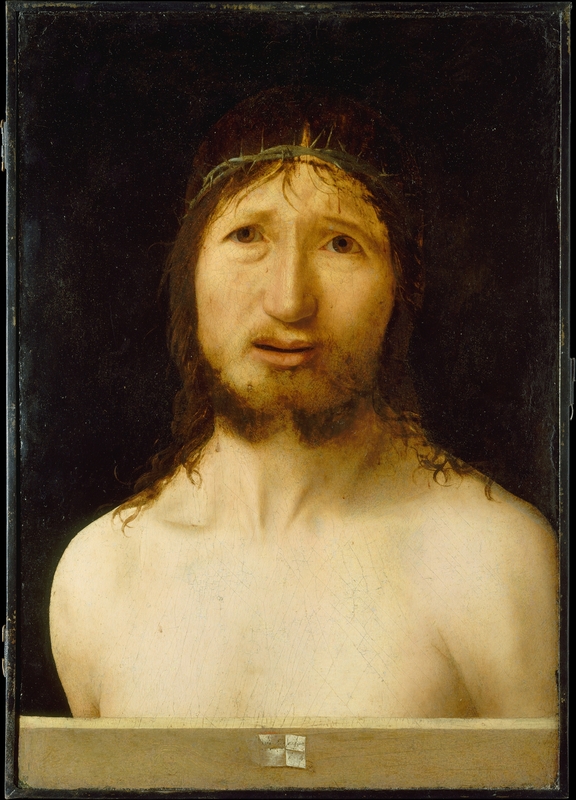 I will be speaking about a number of beautiful paintings, but one in particular fascinates me: Christ Crowned with Thorns by Antonello da Messina (1430–1479). There is something about this painting that portrays the suffering of Christ more powerfully than the others. Antonello chose to highlight Christ’s emotional suffering, and perhaps this is what is so poignant about it. The sad and penetrating gaze of Jesus grabs the viewer and allows no room for indifference. In the midst of his suffering, Jesus looks at the viewer and pleads for mercy. He looks out at us as if to ask for some respite from his torment. Paradoxically, our merciful God is asking us for mercy. The same loving eyes that looked with mercy upon the Samaritan woman, the humiliated adulteress, and greedy Zacchaeus, now look out at us begging for us to return his love. In this portrayal of Jesus Christ, we see our God in a disconcerting position of weakness. Yet, while he is completely exposed and vulnerable, his gaze remains firm. Even as his physical strength wains and weakens, his love for us remains strong. He will not waver as he bears the punishment of our sins: his love for each of us is too intense for that. This Holy Week, take time to go to the local church or to a quiet place in your home and peacefully contemplate the face of Christ. Use this image or any other one that moves you. Look at him and ask him for one grace: to understand how much he loves you. He always answers that prayer, and in one way or another you will experience the peace that comes with knowledge of his love.